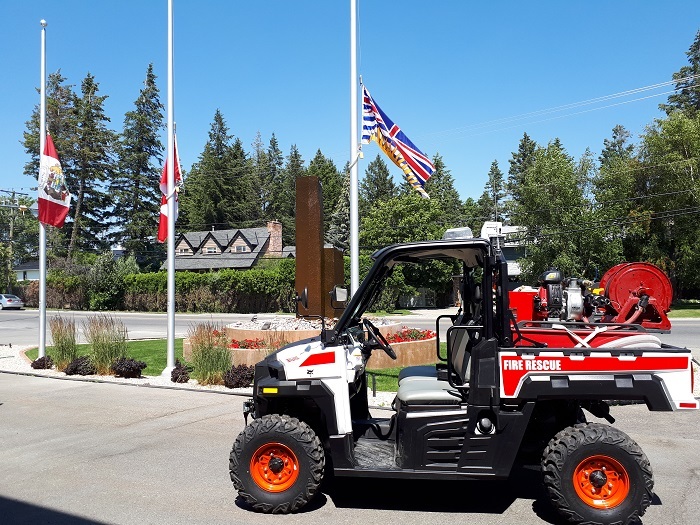 Cranbrook, BC (July 20, 2018) -- A new side-by-side off-road vehicle has been added to the Cranbrook Fire & Emergency Services equipment fleet Friday, arriving just as the wildfire season begins across the province. The new vehicle will provide support in helping reduce the wildfire risk around the City by increasing access of the fire department into areas not easily accessible by the larger vehicles. The vehicle also provides better access for emergency responders to extract patients from hard to reach areas. The off-road vehicle carries an 85 gallon water tank and a variety of hand tools. If you are out enjoying any of our forested or green space areas this weekend, whether it is hiking or camping, please remember to be fire safe. Conditions are extremely dry and fires can escape and spread very quickly. Please make sure any campfire is fully extinguished and the ashes are cold to the touch before you leave it. If you see smoke or fire, don’t assume that others have reported it. Call 1-800-663-5555 or *5555 on your cell. For the latest information on the current fire situation across the Southeast Fire Centre, including restrictions, fires of note, statistics, news and more, visit the Southeast Fire Centre website at http://bcfireinfo.for.gov.bc.ca/hprScripts/WildfireNews/FireCentrePage.asp?FC=6.